Real estate developer Charles Fillmore and his wife, Myrtle, founded Unity in Kansas City in 1889. Suffering from ill health, the two used prayer and affirmation to help them heal. Soon friends joined them in affirmative prayer and the Fillmores began writing about their metaphysical beliefs and experiences. In the beginning the Fillmores were interested in giving people practical tools in Christianity to improve their lives. Thus, the Unity Movement began. Now Unity churches are in major cities across the country and worldwide. Unity World Headquarters, Unity Village, located on a beautiful 1,400-acre campus 15 miles southeast of Kansas City, serves people from 150 countries through its threefold mission of prayer, publication and education. Land for Unity Temple on the Plaza was purchased on Kansas City’s Country Club Plaza in 1928. 15 years in planning and five years in building, Temple services were first held in 1948, and the sanctuary was completed in 1950. The congregation celebrated this milestone with a capital campaign to maintain the building for the next 100 years. 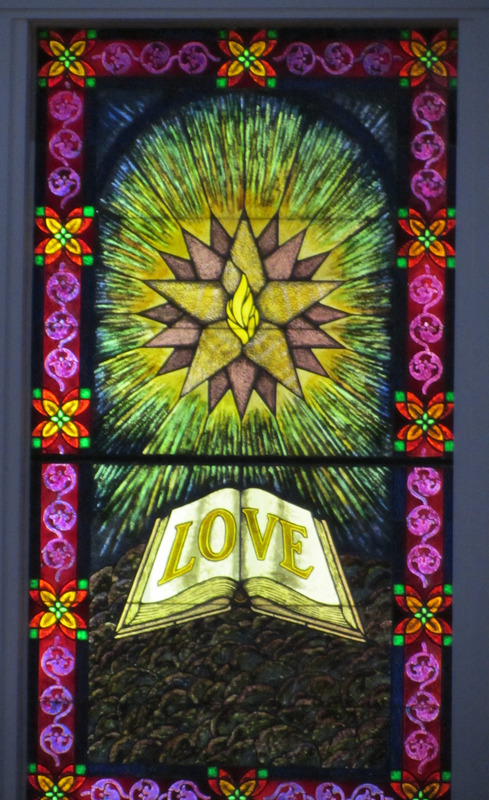 The Chancel “Love” window symbolizes the evolution of love in human consciousness. The star’s five points represent prayer, healing, teaching, worship and community. The Love Window is one of the original windows from 1950’s. The symbolism was outlined by L.E. Meyer, designed by Daniel MacMorris, and commissioned by the Women’s Auxillary in 1950. In 1971 fifty eight windows throughout the Temple were replaced with new designs by Ernest Wilson and Paul Mann. Unity Temple’s sanctuary seats 1,255 people. The Love Window is the primary focus of the sanctuary and the Unity Wings are carved in wood just below. The Charles Fillmore Chapel seats 300 people and is built with the same attention to detail and artistic beauty as the sanctuary. The four stained glass windows in this chapel represent the four Gospels: Matthew, Mark, Luke and John. The Myrtle Fillmore Chapel seats 30 people and honors her simple and practical spirituality. The stained glass windows depict the close relationship of the feminine to the Divine. The Spirit of God lives within each person; therefore, all people are inherently good. Through the power of affirmative prayer and meditation, we deepen our understanding of Spirit. Knowledge of these Spiritual Principles is not enough. We each need to put them into practice in our daily lives. The Unity Wings represent two unique aspects of Unity. The globe in the middle represents the human consciousness of our existence and the wings represent our spiritual aspect, which lifts us up above any situation or circumstance that hampers our peace of mind or well-being. The Love Window in the Temple’s main sanctuary features the five-pointed star, which symbolizes the five main ministries of Unity Temple: Prayer, Healing, Education, Worship and Community. The lower right point, thought of as the right foot, represents Prayer. “Is it not written, my house shall be called of all nation the house of prayer?” Mark 11:17. We are always putting forth our right foot when we turn first to God in prayer. The second point is Healing. Out of prayer there always comes a healing, an inward healing, if not yet manifest. “He sent thee to heal the sick.” Luke 9:2. The third point is Education. When we stand on our two feet of prayer and healing then we are ready to share our experience in education. “Go ye therefore, and teach all nations.” Matthew 28:19. The fourth point is Worship, the putting forth the law of God. “All things must be done lawfully under God’s law. And he sent them to preach the kingdom of God.” Luke 9:2. The fifth point is Community or loving one another as God loves us. Love is indeed the fulfilling of the law. We fulfill our knowledge of God in action, applying our knowledge of Truth to everyday life. “A new commandment I give unto you, that ye love one another.” John 12:34. Beneath the five-pointed star is the word “Love,” which is the foundation for each of these ministries. The flame at the center of the five-pointed star represents illuminated consciousness. “There was the true light, even the light which lighteth every man coming into the world.” John 1:9. This is the Christ, the I AM, at the center of every man’s being. Thus, in a sense, this star is symbolic of humankind. The points around the star represent the twelve disciples and the 70 sent out by Jesus. “The Lord appointed another seventy also, and sent them out two by two… into every city and place.” Luke 10:1. The myriad points radiating out of the star symbolize those continuing to educate, pray and heal. They are radiating the Christ consciousness into the world. “Feed my sheep.” John 21:17. The clusters around the border represent the twelve disciples.